The World Food Programme’s vision is to eradicate hunger in our lifetime, a bold aim that is manifested in the Sustainable Development Goals and is at the centre of Agenda 2030. Zero Hunger cannot be achieved without urgent and ambitious action to address the challenge of climate change. As the largest agency fighting hunger worldwide, WFP is working to understand the effects of climate change and help food-insecure communities prepare for, respond to, and recover from climate-related disasters. A large part of our work involves helping governments to analyse and understand the links between food security, climate hazards, and climate change so that they can take the necessary actions and investments to eradicate climate-related hunger in their country through more effective policy and programme. 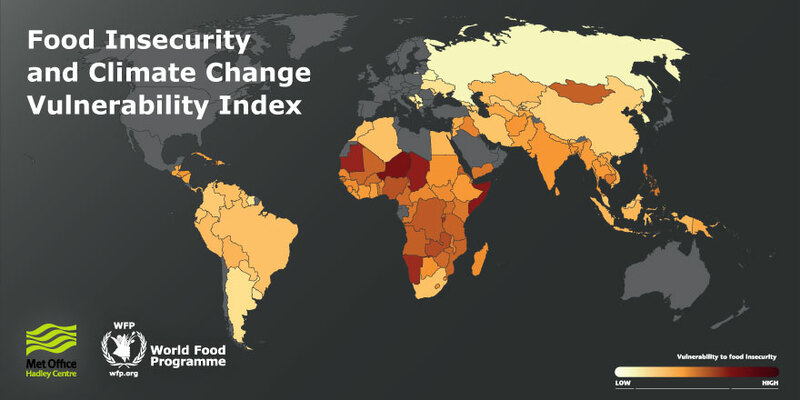 Climate risks today have a disproportionately negative impact on food-insecure people, 80 percent of whom live in countries that are prone to natural disasters and face high levels of environmental degradation. Climate change will make these risks worse – and make the investments needed to achieve – and maintain – Zero Hunger even greater. Depending on our actions, future generations will inherit a world with less vulnerability than today – or a world with significantly more vulnerability to food insecurity. A world where keeping hunger at bay is achievable – or one where we will struggle to keep the scourge of hunger at bay. WFP believes that hunger can be eradicated by 2030. But this rigorous scientific analysis presents a sobering picture, showing that climate change is making the task more difficult and costlier. It shows that even after 2030, because of climate change we will need to remain vigilant and continue to invest heavily in adaptation to preserve the gains we make in the next 15 years. Massive increases in investment are needed to end hunger by 2030 and to enable the poorest people to build resilient livelihoods. But we must do more than simply achieve the SDGs – we must build a world where they are maintained and continue to improve. To do this, we must make sure we address the causes of climate change and continue to invest in resilience and adaptation after 2030 to protect the gains we will have made.